The colors are a bit different in the layered version and there's also a thin variant of the ship in the archive. I have noticed though that under the GPL licence terms, editing the sprites is not allowed. I would however like to add exhaust flames. 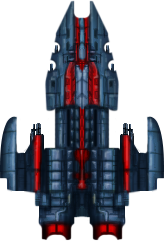 Another thing is that while I was working on the game, I used the spaceship sprite and edited it untill I got my Enemy spaceships that look this. Is it okay if I keep using these enemy models? > I have noticed though that under the GPL licence terms, editing the sprites is not allowed. Huh? Are you mixing up GPL and CC-*-ND? > Also I'd like to say that those 2 licences are confusing. The whole point of the GPL is to ensure that your right to change is preserved. That's the copyright header for the license itself -- you may not change the GPL. Controls: ARROW KEYS to move around, SPACE to shoot and ENTER when you die. GPL allows change as long as you give credit as to the original creator, the changes made, and is licensed the same (therefore allowing others the same freedom you had). It is confusing, especially considering GPL is meant for software, not graphics. So yes, I understand just how confusing it must be. Basically, GPL is like CC-BY-SA, but way more compicated (because it's meant for software).